“EEEEYYYYAAAH!” the responding kiai came from the students already out there strutting their stuff under the watchful eye of Sensei and other club instructors officiating. I could just glimpse Sensei’s impassive face occasionally between some of the students nervously awaiting their turn to grade. Why do we put ourselves under this strain? People have a strange preoccupation with examinations, we constantly put ourselves in the position of having to test and then almost have a nervous breakdown in the process! Different clubs use different methods, some test the students constantly in the Dojo and then award belts in a low profile way when the student is ready, some put the students through a really harsh test every few months, some make a big display of the test and even hire a theatre for Black Belt gradings, inviting everyone and even selling tickets! Some instructors like their students to be tested by other senior dan grade instructors and some prefer to do the testing themselves. Some say that the test is an important part of the learning process because it puts the student ‘on the spot’ and others say that the student should be tested gradually increasing the pressure as the student learns to cope in the Dojo environment. Sensei was the highest grade on the panel and therefore sat in the middle of the group of examiners and was in charge of the proceedings. Finally, at the end of a long day came the tears of those that failed and the smiles of those that had passed. I always thought of how difficult it must be for sensei to fail students on a grading, to have to look at the hopeful faces with mum, dad, grandma and grampa all waiting with cameras at the ready – and tell them that they hadn’t made it. Finally all the certificates and belts had been awarded, grading books and licences signed and stamped, tears shed and hugs of congratulation and sympathy shared. Everyone now gathered for Sensei’s closing speech…. “First of all I would like to congratulate those that passed their exam and my sympathy goes with those that didn’t. In many ways not passing an exam is the same as passing because the end result is the same, you have to return to the Dojo and work hard! For those who succeeded, you have a new part of the training syllabus to get stuck in to and for those that didn’t succeed, it lets you know what you need to work on to pass next time. It only becomes ‘failure’ if you stop trying. Resolve and determination are qualities a martial artist must possess, if you stop trying because you didn’t pass an exam you don’t possess the basic requirements for a martial artist anyway. I am sure you would not want me to award a belt that you didn’t deserve and would look foolish wearing. That would be a ‘criminal’ act within the Martial Arts and my purpose here today is to act as guardian of the standards. I promise you that I will not let you, or the standards down. Watching today I realise how old I am. I watch the children and grandchildren of my friends and students grading. My own grandchild is grading here today. I watched you all receive the results of your grading and your reaction to the news. A good martial artist in my day would receive the result of their grading either way with equanimity. If they passed, they would not want the people who didn’t pass to feel bad. They also knew that it was only a belt and piece of paper that marked the relationship between them and their sensei. As it is a mark of this relationship, what should be your first action on receiving news of success? In my day our first action would be to thank sensei for his instruction and help as the whole learning process is a joint effort. I remember my iaido sensei would send me to a dan grading with the instruction “if you fail, don’t come back!” I never failed, so I never had to face the problem of not returning, each time I passed I would bring back a present thanking him for his help. He would take the present still wrapped and place it on the Shinto shrine in his house and clap to awaken the gods. It was always a poignant moment for both of us. How many of you thanked your sensei here today? How many of you will go back home and thank your sensei? I hope, all of you as it is a mark of respect and of your joint effort. I admit I’m old, I come from the days when men removed their hat when entering a building, when they would stop and remove their hat and watch as a mark of respect as a funeral went by. When a man gave up his seat to a lady and opened a door for her. ‘Respect’ is an oft-used word nowadays, but you don’t see a lot of it. 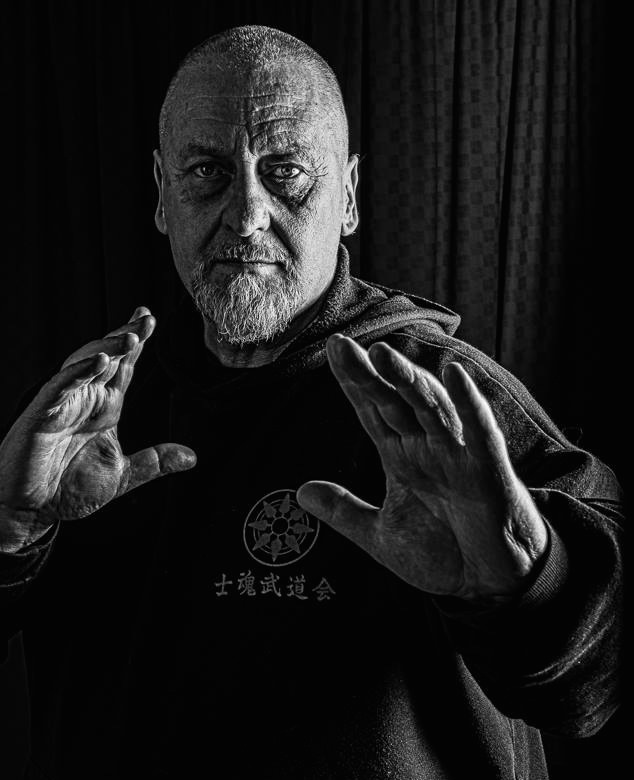 My request to you today is to keep it alive between yourself, your sensei, sempai and kohai, allow it to develop over the years so that you can experience the richness of life that I have had with my martial arts family. We all filed out of the hall feeling that we had ‘glimpsed’ a little bit of the mind of a real martial artist.